Welcome to the NBA 2K11 portal! 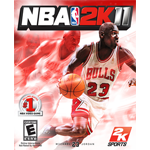 This is a central hub for all the NBA 2K11 content here at the NLSC including news, reviews, feature articles, downloads and more. Download V3 of the College Hoops 2K mod, as well as court updates for the 2019 NBA season, in today's File Additions for NBA 2K11. Download the latest releases from DaCrispy, including an updated G-League mod and court creation template, in today's NBA 2K11 File Additions. Download a court modding template by DaCrispy in today's File Additions for NBA 2K11.